Have you guys heard of the The Smart Talk? It’s a really cool (free) interactive platform that provides tools for parents to set online security rules, for their kids. I mean, let’s face it, data safety and identity safety is a big deal right now (remember the time that I was catfished?) Have you considered the fact that you need to control your kids screen time? We’ve been especially trusting when it comes to Kyle and his online activity. I mean, I don’t even really check his cellphone. And the thing is, no one wants to be the parent who launches into a full on FBI investigation when it comes to your kids electronic devices. It can be useful to keep a service like LifeLock (who partnered with National PTA to put together the Smart Talk site) running in the background incase your child’s online identity was compromised without you noticing. Oversharing has become the new norm (and I can say this, because you’re reading my blog right now, point and case). We should be talking to our kids about the potential dangers of social media and we should be monitoring their device usage. We need to be setting rules for our kids wrt screen time, what they are watching and who they are able to be in communication with. 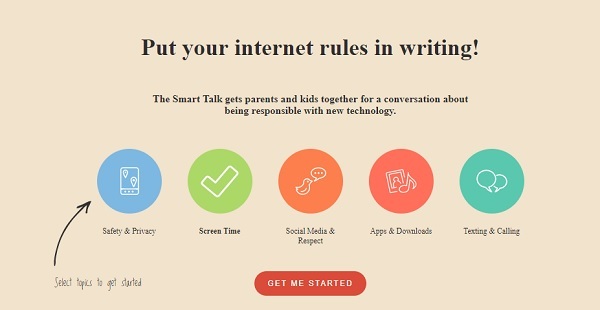 And that’s why I really love the idea behind The Smart Talk platform. The website is really easy to navigate and creates opportunity for you and your child to determine what their online boundaries should be. Things like screen time (when is it allowed, and for how long etc), social media and even apps and which downloads are permissible, is taken into account. At the end of the little survey, you and your child enter into an official family agreement, that sets certain rules in place. The agreement is personalized and printable and you guys can sign on it, to make it official. Stick it up on on your fridge, as a friendly reminder, to help safe guard your kid against the perps of the online world, and hey, to empower them to be smart digital citizens. What do you guys think about this? Have you set any boundaries in place wrt screen time? Drop your thoughts and pieces of advice in the comment section below.